Skyrocketing oil prices have prompted Matson Navigation Co. to raise its fuel surcharge by 4.5 percentage points, or 13.3 percent, for service between Hawaii and the mainland. This marks the second-highest percentage-point increase for the state's largest ocean carrier, whose surcharge will jump to 38.25 percent from 33.75 percent on July 13. Businesses from home-improvement companies to car dealerships will be squeezed by higher shipping costs and likely will have to raise the price of goods and cut costs elsewhere to deal with the latest increase. 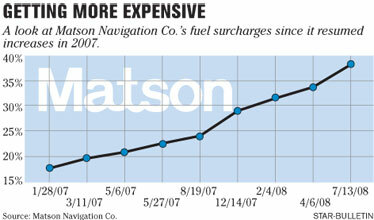 Matson Navigation Co., citing unprecedented fuel prices, is boosting its fuel surcharge for Hawaii routes by 4.5 percentage points - the second-largest percentage-point increase in its 126-year history. "With fuel-related costs reaching historical highs," Matson said the surcharge for its Hawaii service will jump to 38.25 percent from 33.75 percent - a 13.3 percent gain - on July 13. The only larger percentage-point increase was in December when the ocean carrier raised the fee by 5 percentage points, to 29 percent from 24 percent. "Escalating fuel prices have hit levels that are unprecedented and are adversely impacting virtually all businesses as well as consumers," said Dave Hoppes, Matson senior vice president of ocean services. "For transportation companies, fuel-related expenses are unavoidable." Matson's fuel costs have jumped 27 percent in the past month, while overall fuel costs have increased a staggering 38 percent since its last surcharge hike on April 6. Matson also is drastically raising the fuel surcharge for its Guam/Commonwealth of the Northern Mariana Islands and Micronesia services by 6 percentage points, or 17.8 percent, to 39.75 percent from 33.75 percent the same day. The company, which traditionally has applied the same levy to all of its Pacific service, said the new program reflects the greater fuel required to serve more geographically isolated areas of Guam and Micronesia. "They're doing the same thing the airlines are doing and I'm sure their competition is doing - it's just a reaction to our energy prices," said Leroy Laney, a Hawaii Pacific University professor of economics and finance. "I don't blame the airlines, Matson or anyone else for gouging us. It's just one more way the state economy has to pay for higher energy prices." The additional surcharge will increase the overall costs of doing business for Matson customers such as City Mill Co. Ltd., which will have to pay a double-digit spike (13.3 percent) in shipping costs, said President Steven Ai. "The rates are moving up pretty fast," he said. "With rising expenses, we just have to manage our business better and watch our expenses and be as lean as we can because we can't pass everything on to our customers." The increase will add $34 to the cost of shipping an automobile from Hawaii to California - and vice versa - bringing the shipping price to $1,089 from $1,055. Wayne DeLuz, president of the Hawaii Automobile Dealers Association and the Big Island's Mazda, Subaru, Hyundai Inc. dealership, said the surcharge increase, combined with a 20 percent drop in demand from a year ago, means the company likely will start shipping fewer cars to the island. "It's just making things more expensive for our customers," DeLuz said. "Disposable income is being depleted. Consumers are just pulling back and just not making purchases - it's a whole domino effect." Matson rivals Horizon Lines Inc. and Pasha Hawaii Transport Lines did not return calls for comment yesterday on whether they plan to match the state's largest ocean carrier's increase. Horizon typically matches Matson's fuel surcharge, while Pasha, which usually will raise its surcharge as well, charges a lower fee. Last month, Horizon pulled back its previously announced 1.5 percentage-point increase, which would have raised the surcharge to 35.25 percent from 33.75 percent last Sunday, after Matson declined to follow its lead. Pasha, which ships vehicles between Hawaii and San Diego, has maintained its 31.25 percent surcharge since April.